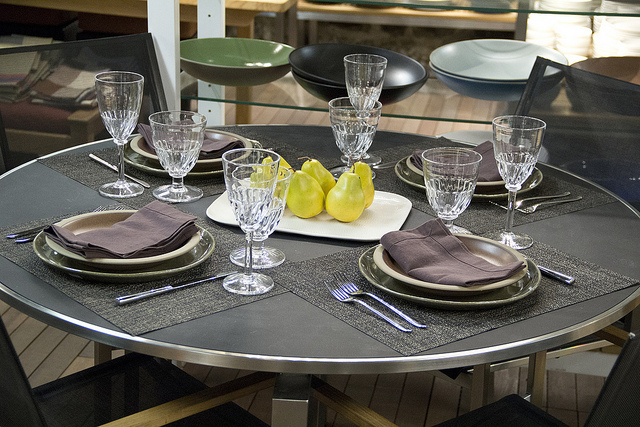 Pears and figs are delicious fruity delicacies, but they're also great props and colors for dressing a table. This week's setting features a tray of vibrant green pears and fig-colored napkins, which are paired with earth tone plates on a grey and black backdrop to created a muted yet still lively tablescape. The place settings began with Chilewich Boucle Rectangular Placemats in Coffee, which softly blended into the black table. Atop those placemats were stacked Simon Pearce Woodbury Dinner Plates in Moss and Heath Ceramics Rim Salad Plates in Redwood. 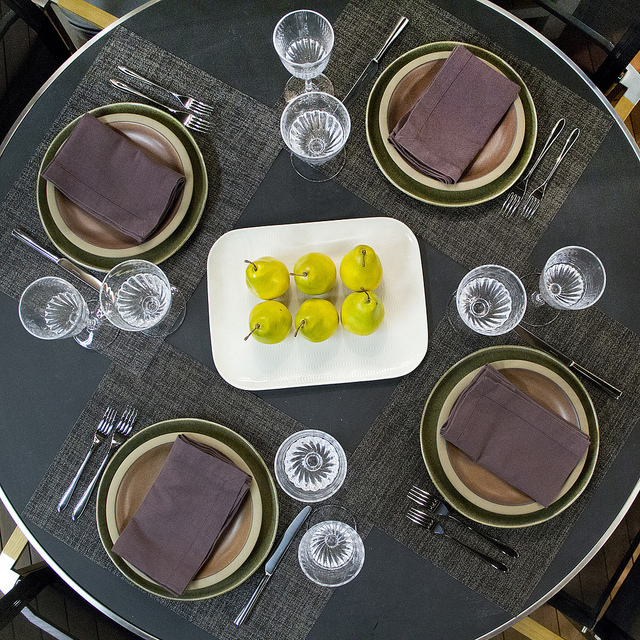 To top it off, we used Libeco Home Tribeca Napkins in Fig for a touch of brighter color. For the flatware, we used a store favorite, the David Mellor Pride Flatware. It's particularly shiny and sleek, which worked nicely here. Glasses both came fro the Simon Pearce Corinth collection. We featured the white wine glass and the goblet, which both feature a subtle antiqued look. I can imagine finding these tucked away in my grandma's pantry. In the center of the table, holding the pears was a Jars Ceramics Empreinte Platter in Stries - White. This fairly new collection has a very organic look and feel, and it worked nicely here to add a touch of bright warmth. What's adorning your table these days?